So, I fell in love with this set when Stampin’Up brought it out last year. Of course I waited until it was on the retired list before I decided to buy it. I love the set, but never knew what to do with it. The colors for this challenge stumped me until I saw the bugs and I knew just how to use the colors. I didn’t have a good sentiment in my stash, so I printed one out using a fun font from the internet. 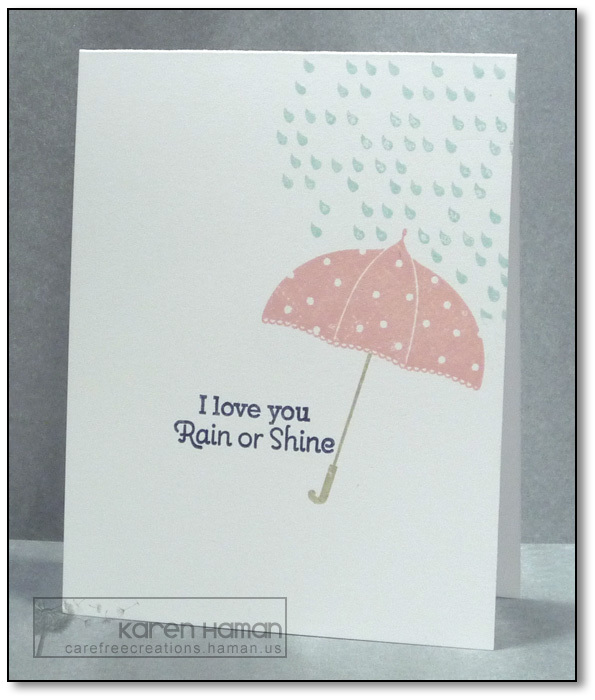 My layout is inspired by this card by Susan Raihala. 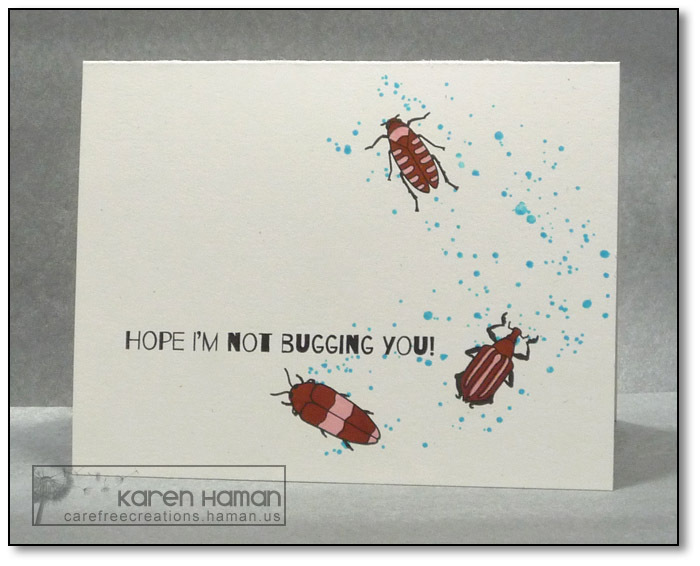 Hope I’m not bugging you! 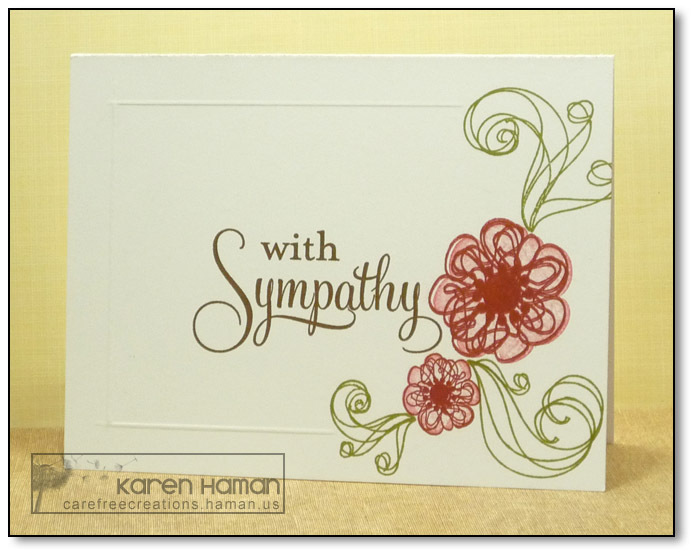 Sadly, I do need a sympathy card. This one is going through the mail, so I kept it a simple one-layer card. The solid layer of the flower is stamped, 2nd generation, with Riding Hood Red and the overlay is Raspberry Ripple. I embossed a partial frame. Getting those corners right is so hard (so mine are not)! The card base is white, but, with the photo taken next to the yellow background, it seems cream colored…I’m thinking that would have been good. Next time. When I was creating my card, Ardyth had just published this card and I loved the shadows on her one-layer card, so I had to do that on this card. Super quick card! I stamped it all out, let it dry a bit, then added shadows with a Copic marker. A Little About the Challenge: This weekly challenge is posted on Thursday, and alternates between color and sketch (if there is a 5th week in the month you get the double dose of color & sketch). I love word play. This made me giggle. When I decided to play this challenge again, I tried to find a very un-Christmas color scheme and challenge myself. 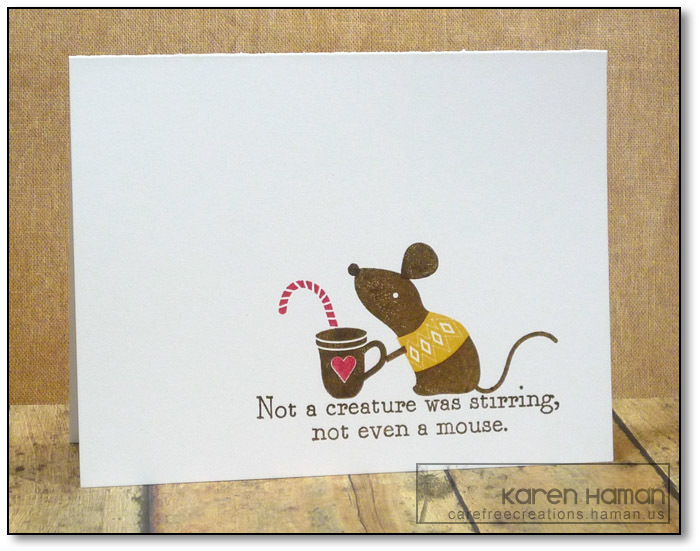 I’m a sucker for critters – and this mouse set is adorable! I did use the “inner” ear because the other felt too big for the composition I had going. 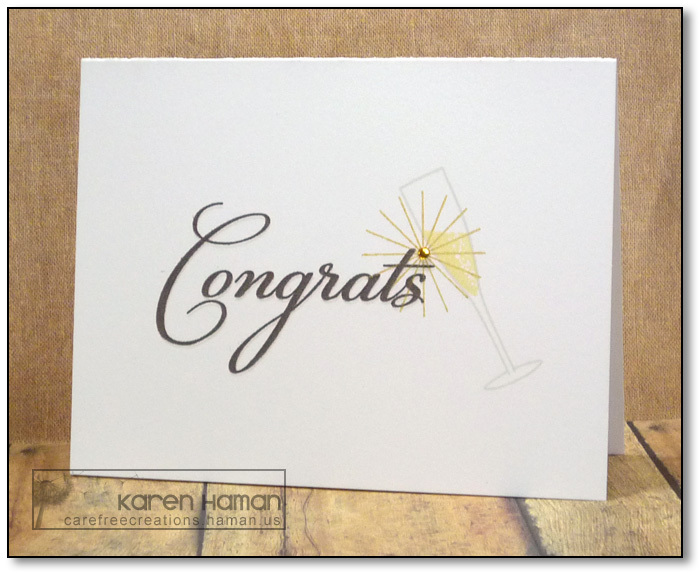 I didn’t have a specific need for a congrats card, so I kept it theme neutral and used a champagne glass to toast the word Congrats. 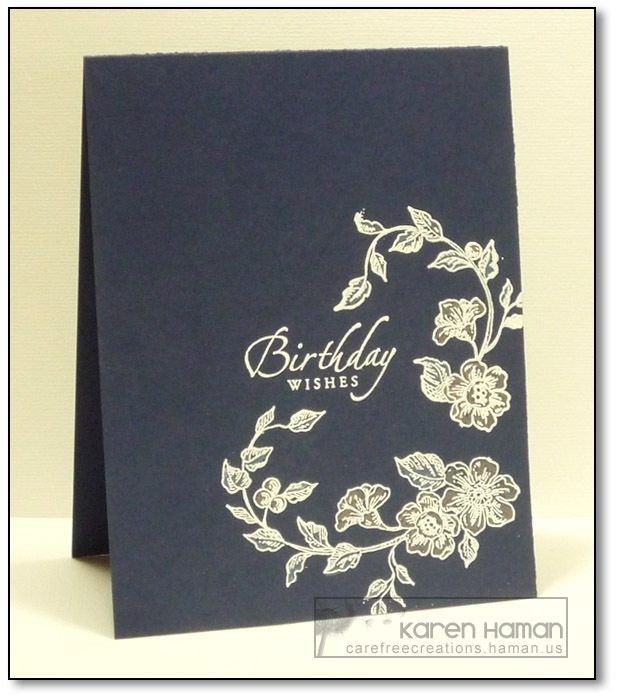 The sparkle is stamped with gold ink and there is a tiny rhinestone in the center to accentuate the clinking. It is hard to see in the photo, but I added a shadow to the word by stamping it again, slightly lower, using the light grey ink (the same I used on the glass). Addicted to CAS is also having a Design Team call. I’m putting my name in. 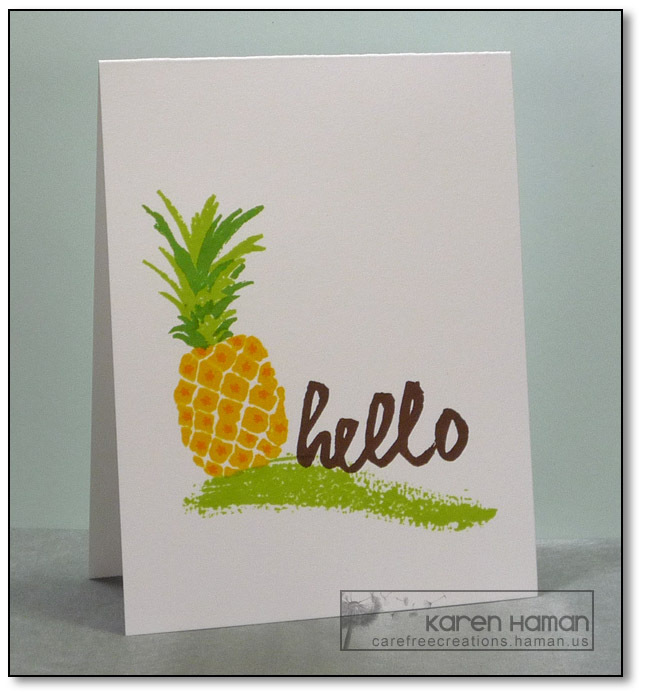 I made this card for the One-Layer Simplicity Challenge. This month is Peace Be With You. For me, being around nature, especially woods, is peaceful for me. That is why I chose a bamboo image and green and brown colors.